A good night’s sleep is a fundamental part of our health and wellbeing, and means we are more alert and productive during the day. So why do so many of us find it hard to achieve? Claire Scullin seeks expert advice on how to help employees improve their sleep routine. In today’s technological age, many people find it hard to switch off. Watching television until late, and checking mobile phones and iPads in bed is commonplace. But it is our minds that are the biggest cause of sleep deprivation. We worry about our jobs, our relationships and our family, and this can affect our ability to shut down. So, what are the biggest reasons for lack of sleep; what are the negative effects it can have on workplace productivity; and how can we combat it? Dr Guy Meadows runs The Sleep School, based in central London, which specialises in non-drug based insomnia therapy. He has helped more than 3,000 insomnia sufferers achieve good quality sleep through one-to-one sessions and group therapy. We spend one-third of our lives asleep (roughly 25 years in an average lifetime). Around 37% of UK adults suffer from insomnia. Traffic accidents increase by 25% in the weeks after the clocks go forward. (Source: The Sleep School). Lack of sleep can cause weight gain of up to 2lbs a week (Source: Proceedings of the National Academy of Sciences, 2014). You can survive for up to three months without eating, but only 11 days without sleeping. Research by the school highlighted that a single bad night’s sleep can reduce productivity by 57%, and it can decrease physical and mental awareness. Conversely: “A good night’s sleep is the most underrated performance enhancer known to mankind,” says Meadows. During the night, our mind works overtime to diffuse stressful situations that we may have experienced during the day and manage any negative thoughts. It also enhances physical ability for the following day, lowers our blood pressure and improves our memory. All of these are essential contributors to a successful working life. Accident risks are greatly enhanced when we are tired, as is our ability to concentrate and multitask. One of the biggest, and most underrated, effects a lack of sleep can have is on weight. This is because employees who are tired are more likely to choose high-sugar, high-calorie foods to raise their energy levels. When we are asleep, our body produces the hormones ghrelin and leptin. Ghrelin (the “hunger hormone”) signals to your body that it is time to eat, and your body produces more of it when you are tired. Leptin (the “satiety hormone”) regulates your energy balance and suppresses food intake, and less of this is produced if you are lacking sleep. If an employee is overweight, it could affect their ability to perform day-to-day activities, and obesity can be classified as a disability under the Equality Act 2010. If an employee does suffer from a sleep disorder, then an employer could consider implementing changes, such as offering alternative working hours or allowing them to work from home. Many people are often reluctant to disclose these disorders to their employers, and it is an issue that has largely gone ignored thus far by OH. 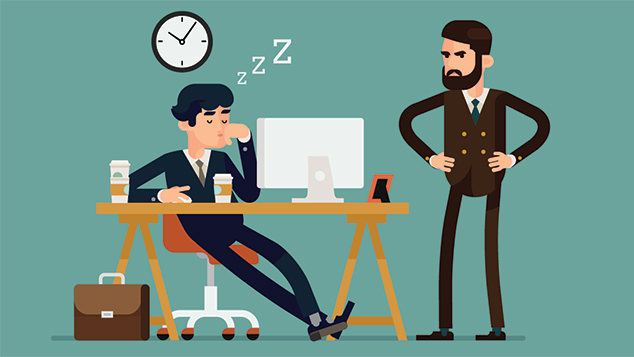 A lack of sleep has a huge impact on workplace performance, so employers could consider introducing initiatives such as workplace monitoring, encouraging healthy eating and allowing staff the time to exercise in their lunch breaks. BT is one company taking this monitoring a step further, by encouraging its employees to sign up for a Fitbit activity tracker. The company will use the personal data collected to record sleep patterns, with the aim of linking metrics around staff wellbeing to its health insurance scheme. While the average recommendation for a good night’s sleep is seven to eight hours, it can range anywhere from four to 12 hours per individual. Some people can function on very little sleep, while others need up to 10 hours to feel rested. If you wake feeling refreshed and ready to face the day, then you have probably had enough, according to Meadows. He also believes that it is not so much the quantity of the sleep, but the quality, that matters. There are three different stages of sleep: light sleep; deep sleep; and rapid eye movement (REM) sleep. Light sleep is where your heart rates slows and temperature drops, and your body is preparing for deep sleep. Deep sleep is where your body repairs itself, regrows tissue, builds muscle and strengthens your immune system. The next stage, REM (or paradoxical) sleep, is where we dream, our memory processes and our emotions are managed. We only sleep in the REM stage for approximately 90 minutes each night, but a lack of it can cause depression and anxiety. Conversely, too much of it (without falling back into deep sleep) can also leave you exhausted and less able to wake easily. Let go of the rituals – follow a regular wind-down each night – any reliance on unnatural nighttime rituals or props (eg always having warm baths/drinking hot milk) can fuel sleep anxiety. Be mindful – worrying about poor-quality sleep in the past or that you will not sleep only helps to increase night arousal levels. Try to notice little things such as the feel of the duvet on your skin or breathing in and out to promote sleep. Welcome thoughts and emotions – fearful thoughts or anxiety at night can keep you awake. Learn to change your relationship with negative thoughts, recognising and even welcoming them when they arrive. Stay in bed – conserve your energy by lying still and being calm and relaxed. Try not to struggle with your negative thoughts or emotions or get out of bed. Keep on time – go to bed and get up at the same time – this will help to keep your body clock regular and promote your natural drive to sleep. Limit naps to less than 20 minutes. Adopt healthy habits – live a healthy lifestyle – for example, drink a moderate amount of caffeine and stop by 2pm. Limit alcohol consumption, especially close to bedtime, and exercise regularly during the day or early evening. Sleep in a cool, comfortable, quiet and dark room. Have a healthy breakfast. Live your life – take small actions each day to do things you enjoy; a happy brain is a sleepy brain. Switch off – turn phones or tablets off at least 40 minutes before bed; unnatural light can act as a stimulator. This is why, although power-naps have been proven to have a positive effect, the length of them is crucial. Although it may be impossible in most workplaces to install “sleep pods”, a 10- to 20-minute nap can help employees be more alert in the afternoons, and it is more beneficial than the alternative, which is usually caffeine or a chocolate bar. Is your lifestyle to blame? Many of us may follow all this advice and still have trouble sleeping. If so, then the answer may be to do with your lifestyle. Lack of exercise, poor diet, and too much caffeine, smoking and alcohol are all things that will negatively affect your sleep. A common mistake is to drink alcohol thinking that it will help you drop off but, although it does have an initial sedative effect, it then becomes a stimulant and results in fractured sleep. It also increases your heart rate and body temperature, and, as the effects wear off, it wakes us up. Diet is also key, and sugar is a stimulant and should be avoided at least three hours before bed. And, while the effects of exercise are widely documented, exercising too close to bedtime can cause a raised heart rate and also delay your sleep. One of the main problems, however, is stress. According to The Sleep School, 70% of a person’s thoughts are negative, and “calming busy minds” is something Meadows and his team focus on. We worry so much about our past events or current problems that we cannot switch off and relax. Mindfulness is the key to this. Instead of trying to ignore your problems, you should “tap into them”, recognise them and tune into the things around you. Focus on tastes, smells, breathing and everything in your environment. It is about being calm, says Meadows, and facing your problems head on: “Accept them, and let them go.” Ignoring them does not work as they will come back even stronger next time. It is advisable to take part in recreational activities that you enjoy during the day, as this raises serotonin (the “happy hormone”) levels and exercise can reduce stress levels and depression, and encourage deep sleep. Insomniacs often try and “fight it” – they have a long list of activities and ways of trying to fall asleep – watching the clock, reading, getting up and walking around, and searching for a “cure” that does not exist. If employees are less stressed, have a healthy lifestyle and follow these tips to ensure a decent night’s sleep, they will be more productive and alert, and less prone to accidents and underperformance. Dr Guy Meadows is a sleep physiologist at The Sleep School and author of “The Sleep Book – How to sleep well every night” (Orion, 2014).